From Hiba Dlewati who eloquently says the words that only come out in tears, anger and cursing from me. “I read the news, and I can’t get over all the headlines of Aleppo ‘falling’ this week. People fall before cities. Syrians broke the wall of silence in 2011 but it brought us crashing down with it long before this week. “Aleppo ‘fell’ when three medical students bodies’ were found burned to death after being detained by government forces for volunteering at a field hospital. If “fell” when helicopters releasing barrels full of explosives on opposition-held neighborhoods became the norm. Aleppo ‘fell’ when blasts killed 83 students at the university and both sides accused each other. It ‘fell’ when rebels started killing people just for living on the other side of the city. Aleppo ‘fell’ when islamists targeted Kurdish neighborhoods and it ‘fell’ when YPG snipers targeted families fleeing from opposition areas on the Castello Road. It ‘fell’ when Russian and government airstrikes caused 80,000 people to flee their homes in the freezing winter towards a closed Turkish border. It ‘fell’ when so many of its youth, so many of its best, bravest and brightest were arrested and tortured and disappeared and killed and exiled. Aleppo ‘fell’ when a quarter million people were besieged for six months with no access to food or medical supplies because the government decided they lived on the wrong side of the city. It ‘fell’ when international aid organizations were too afraid to do their work there and yet also cut off funding to their grassroots partners who were still willing to take the risk. Aleppo ‘fell’ when it became normal for hospitals to operate beneath the ground because they’d be less likely to be found and destroyed by government and allied forces. It ‘fell’ when a day after the government attacked a hospital in the east, rebels attacked a hospital in the west. “Syria ‘fell’ when its government allowed foreign militias who self-identify with a religious sect, to fight the war on its own people, igniting sectarian and regional conflicts for years to come. The rebels of course did the same, taking away the agency of Syrian fighters and civilians – regardless of which side – to reach any sort of ceasefire or settlement on their own without the approval of their regional, competing overlords. “People don’t stay at war because they don’t know any better, or because they don’t learn. People stay at war because the people with power learn they can get away with it and the people without power realize they can’t get out of it. Don’t you dare judge residents of eastern Aleppo for refusing to ‘flee’ or ‘evacuate’ to government-held areas before this offensive out of fear of what was on the other side. Unless you’ve actually been detained by Syrian security forces, you don’t know what it feels like to disappear; to be stripped and beaten and held and violated and burned and diminished into gray, so much gray, until you fall. Your body is real. Spare me the spiritual optimism of the soul transcending and getting justice in some after life. Bodies are real and they break, people break, families break, and they fall before city walls do. ‘THE history of a battle is not unlike the history of a ball,’ said the Duke of Wellington. ‘Some individuals may recollect all the little events of which the great result is the battle won or lost, but no individual can recollect the order in which, or the exact moment at which, they occurred, which makes all the difference as to their value or importance.’ Equally true would be any attempt to describe a terrorist atrocity. Saturday’s attempted attack by an al-Shabaab suicide car bomber in Mogadishu targeting – depending upon who your source is – the Somali Police Force Academy or the Presidential motorcade is a prime example. In both versions, the operation went dramatically wrong, with the bomber getting lost and having to ask Somali security forces for directions to the target. The security forces were on a heightened state of alert anyway, because of the President’s visit to a nearby college. But they were wary of the man anyway: clearly not a resident of the city, his disorientated, dishevelled state and pronounced limp aroused their suspicions. He was identified by a female shopkeeper as the driver of a parked vehicle, but denied it was his. As an officer investigated the vehicle (which was parked some distance away), the explosives in the car were detonated. 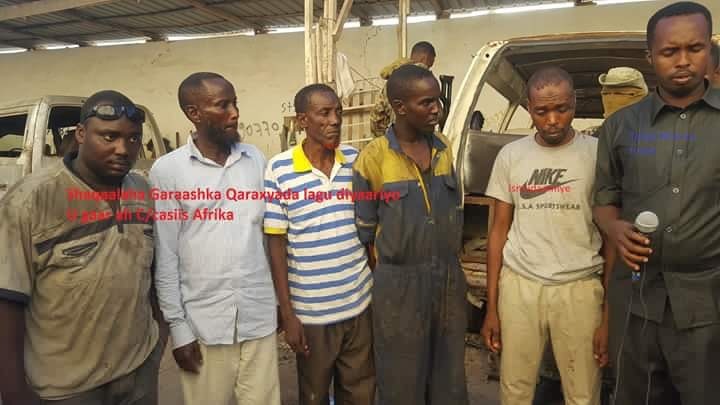 The driver of the vehicle was immediately taken into custody and a number of arrests were made at a garage in the city where he claimed the attack had been planned and the car bomb assembled. Putting aside the amateurishness of the attack, which possibly represents al-Shabaab’s difficulty in finding willing, competent attackers from amongst its dwindling ranks, the human tragedy of the attack stands out, even in a city that has suffered regular and horrifying attacks. Many men and women, shopkeepers and customers, the passengers of a crowded mini-bus, a number of children from nearby schools, were killed. (There was a particularly poignant image on Twitter of some shredded jotters – but it could have been taken anywhere, at any time.) The driver of a passing petrol tanker was killed, but fortunately the tanker itself did not explode, otherwise the death toll would have been even greater. The exact numbers are still unclear and it is not the business of this blog to perform al-Shabaab’s Battle Damage Assessment for it anyway. Suffice to say dozens of casualties. Al-Shabaab rationalises its attacks using the perverted logic of ‘legitimate targets’ – proximity to a target justifies the deaths of the hapless civilians who happen to be nearby. If you hang around with politicians, security forces, foreigners, then you deserve to die along with them, says al-Shabaab. But how can al-Shabaab justify this atrocity? It is unsurprising that their spokesmen have been unusually silent in the aftermath of this attack, despite it clearly being their handiwork. Despite its proclamations, Al-Shabaab’s war is not with the government, the security forces or the international community: it is a war on the population. And the population has proven itself to be consistently, unconquerably resilient.